One way would be to use Doxygen: the include graphs would help me. But there must be a more direct way? The good thing with an open source framework like Eclipse is that if I have a problem, then many other Eclipse users had it probably too. And then the chances are pretty good that someone has volunteered to solve that problem. And indeed, that solution exists :-): The Include Browser view. Ah! I can simply drag&drop into that view. Note: Drag&Drop does NOT work in this case from the Processor Expert ‘Project Panel’ view :-(. Drag&Drop from the CodeWarrior Projects view works as expected. 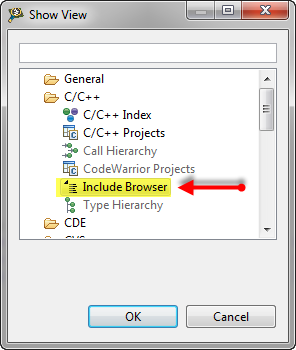 Include Browser with Files: what is included from queue.c? So now I see what is included directly and indirectly by my files. Even more, I see what is included as system include (marked with <>), and inactive includes are grayed out. 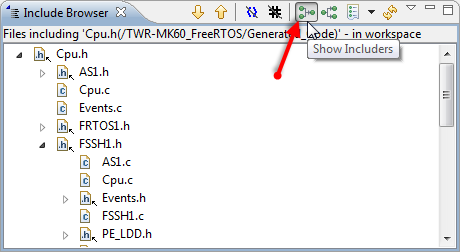 There are two toolbar items to turn these on or off. I can double click on a file and it will open me the exact position of the include: really cool! What is included by Cpu.h? As above, I can navigate though my whole include trees, really cool!